The Comal County Conservation Alliance is a nonprofit organization working to protect land, water, and wildlife in Comal County. The Hill Country Alliance is a nonprofit organization whose purpose is to raise public awareness and build community support around the need to preserve the natural resources and heritage of the Central Texas Hill Country. ​“It became clear to the collective ‘us’ that we had to go to a constitutional amendment to guarantee the funds go to the parks account,” said Bristol, a former chairman of the Texas State Parks Advisory Committee. The committee has been pushing for a constitutional amendment since at least 2014. If allocated, the sporting good sales tax — along with entry and use fees charged to state park visitors — is funneled into to the State Parks Account, the second-largest funding source for the Texas Parks and Wildlife Department. Read the rest of the article by Carlos Anchondo by clicking here. 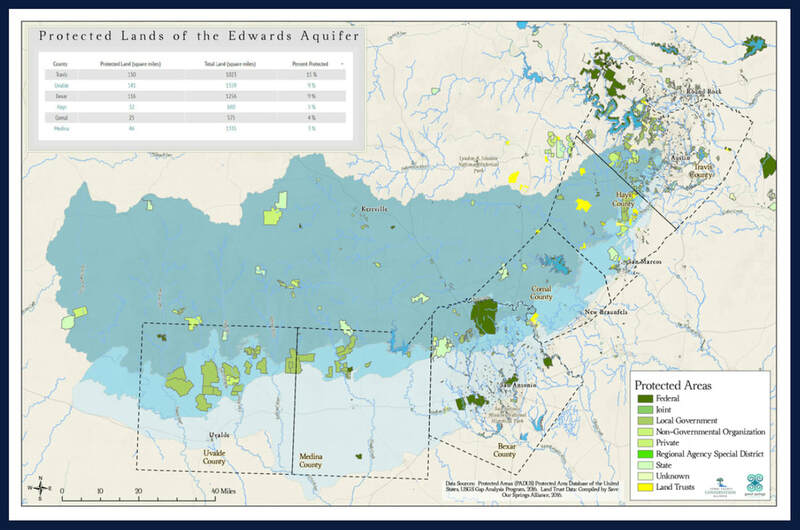 ​The Edwards Aquifer is a world class freshwater supply in a world where that should really mean something. Its crystal clarity and purity provides clean drinking water for millions of people, and it gives rise to great beautiful springs that have nourished minds, bodies and spirits for thousands of years. These great springs have, in turn, given rise to great cities: mainly San Antonio, New Braunfels, San Marcos, and Austin. We are blessed beyond words to live in this place with this natural wonder. And we are responsible for ensuring others who come after us will enjoy and benefit from it as well. The “recharge zone” of the Edwards Aquifer is that part of the landscape (shown in bright blue on the map) where surface water goes directly into the ground replenishing the aquifer and feeding the springs. If it’s covered over with impermeable surfaces — pavement, rooftops, etc. — water cannot recharge, or re-fill, the aquifer. If water goes in dirty, from having run off of urban landscapes, for example, it pollutes the aquifer. That is because this one — the Edwards — is made of porous rock (holey limestone) which does not filter impurities like a sand aquifer might. As the population grows along the I-35 corridor mostly between San Antonio and Austin, the demand for Edwards water increases. Protecting land in the recharge zone of the Edwards Aquifer, then, is essential to the protection of this world class water supply — both its quantity and its quality. And it is also essential to maintaining the flow of these historic, life-giving springs, home to species known nowhere else in the world. This map shows in various shades of green those parcels of land that have been protected, either as parks, preserves, watershed protection lands, national wildlife refuges, state natural areas, private conservation easements, or the like. It shows the six main counties under which the Edwards Aquifer flows, generally speaking, in a southwesterly to northeasterly direction. It shows that as much land protection as has already occurred, there is much more that needs to be done, especially in Comal county. 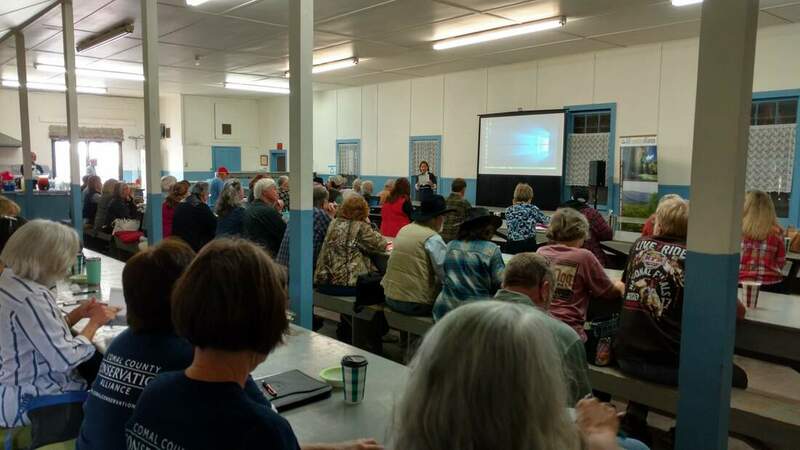 The Comal County Conservation Alliance is working to preserve land throughout the county, about half of which lies over the recharge zone of the Edwards Aquifer. While open spaces throughout the county are needed to preserve the beauty and way of life county residents have long enjoyed — and are fast losing — these lands over the recharge zone are of particular importance for protecting our water. It’s been nearly 30 years since the largest known artesian well in the world was drilled in southwest Bexar County to feed a controversial catfish farm. 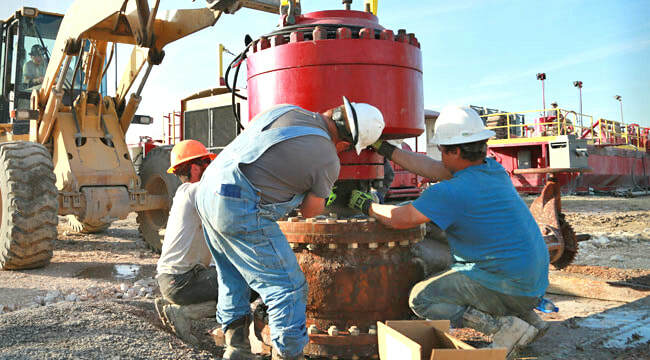 Now San Antonio Water System has permanently sealed off the infamously abundant 30-inch well with mud and concrete. Read the full article here.